You know what? Lorde gets cooler by the day. There's a wonderful recent interview with her on the "WTF" podcast series with Marc Maron, where she raves about her favourite artist of all time, Peter Green. Marc Maron is also a huge fan and the nerdy discussion the follows makes you realise that this girl in truly legit. It's just brilliant banter. Any hows, I don't have to tell you how brilliant Mr. Green is, especially his Fleetwood Mac days. 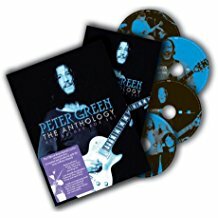 Still one of my greatest finds ever, this 4 CD anthology is just sensational.